Note. What if you don’t see an expand/collapse Filters link? That means that the Dashboard/Look designer didn’t include any filters. We’ve done two things with our new filter. First, we clicked the operator field and changed the operator to is greater than or equal to. Why? You got it: the previous operator (is equal to) would have shown us only those days where the event count was exactly 300,000. Now, we’ll see all the days where the event count was equal to 300,000 or more. Instead of typing signin.traditonal_register, you can simply select the value from the list. Of course, sometimes there are too many possibilities to fit in a dropdown list; for example, you might have literally thousands of cities in your database. In a case like, as soon as the drop down appears, start typing the city name (e.g., Albuquerque). Customer Insights will begin filtering the filter and, the desired name will eventually show up. 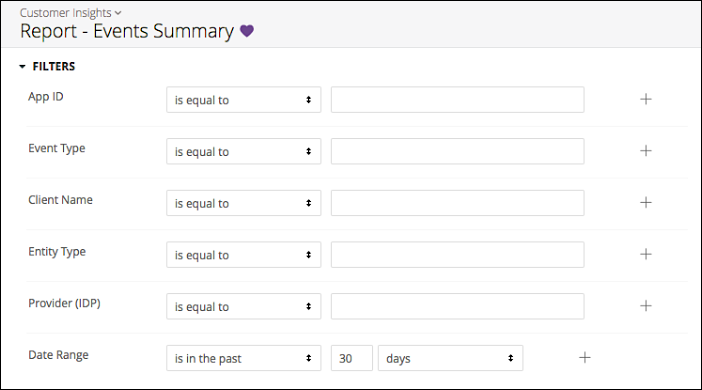 Note that Customer Insights analyzes the field and its datatype, and automatically chooses the Boolean operator (AND or OR) to apply the clause. In this case, OR makes the most sense, so the new clause is added as an OR clause. (Why does it make the most sense? Because a single month can’t have a profile count that is simultaneously greater than 325,000 and less than 250,000.) After clicking +, we selected the appropriate operator (is less than), added the search value (2500000), and then clicked Run. Note. However, you can’t get rid of both clauses: as soon as you’re down to a single clause, the X disappears from the lone remaining clause. To remove a state from the list, just click the little X next to the state name. If you want to reset the Dashboard to its original settings, but can’t remember what those original settings actually were, just leave the page and then come back.